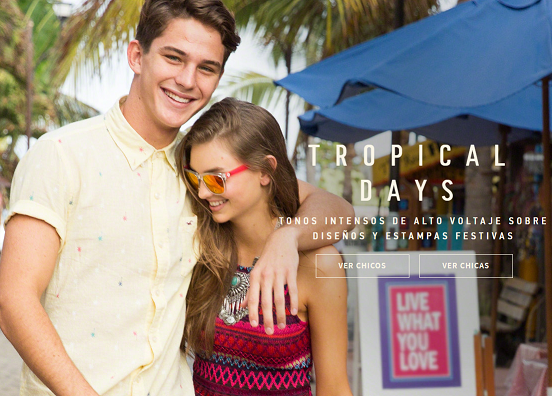 Hollister and Athleta both had photo and video shoots in Sayulita; bikinis and other fashion inspired by Punta Mita and Sayulita has shown up on fashion sites around the world. The promotion of the Riviera Nayarit has extended its notoriety beyond the boundaries of tourism. On this occasion, the fashion world has set its sights on the Destination as inspiration for designs and as an idyllic backdrop for photo shoots and video sessions. The Public Relations office of the Riviera Nayarit Convention and Visitors Bureau (CVB) received two production teams at the beginning of the year, one for high-end sports clothier Athleta, and another for Hollister. Both teams worked on photo shoots and promo videos in Sayulita. The Lane Crawford brand, among other online stores, has a bikini on sale designed by Anna Kosturova, who was inspired by Punta Mita. It’s on sale in countries like Hong Kong and China. Billabong US is selling a Sayulita-inspired reversible bikini to enjoy this spring in their best bohemian style à la Surf Capital of the Riviera Nayarit. In Italy, the Tutto Per Cucinare brand—specialists in kitchenware—launched handbag and backpack designs based on the textures and colors of Sayulita. Sayulita also took top billing in design in the UK’s Net-A-Porter magazine, which showcased a beach dress also inspired by the Riviera Nayarit’s hippie chic retreat. Also in the UK, the on-line catalog Fashiola published several articles of clothing inspired by Sayulita including dresses, bikinis and tops.